Ready to take action on your tummy? These are ‘real world’ workouts. I know that the second you get down on the floor the chances are your kids use you as playground equipment. That’s why I’m sharing with you the tummy moves I love to do on the couch, at my kitchen bench, playground and even lying in bed at night reading the one page of a book I manage to get through if I’m lucky. Cardiovascular fitness is SO important for us women (heart disease is the #1 killer for us) and it’s easier to integrate in to your day then you think. A dance-off in your living room, an invigorating vaccum of your house, some step-ups on a front step or set of stairs. A daily CORE 2-minute workout. So easy - some of them you can even do while checking Instagram, binge-watching your fave Netflix show or sitting at work. Do it once, twice or ten times, depending on your day. A daily CARDIO 2-minute workout. Work to your level of high intensity interval training - research is flowing thick and fast about the effectiveness of HIIT. Not only does it bring physical results but it does wonders for your mood, memory and energy. All workouts sent in an easy-to-follow video format. New workouts each week. You’ll also have access to the Mummy Lost Her Tummy Workout Library where you can pick and choose your daily workout if you’d prefer. Want a longer workout? Combine 10 in a row for a 20-minute workout! 20-minute workout plans emailed each week. Commit to a food CHANGE each week (to be decided on in coaching call - eg. quit eating chocolate after a meal, alcohol-free weeknights, whatever it is that’s not going your tummy any favours). All these LITTLE changes add up to make a BIG difference. To kick off the program hop on a 20-minute 1-on-1 COACHING CALL with Lizzy to plan and bust through what’s been getting in your way. Then each FORTNIGHT you’ll get private coaching with Lizzy for 20 minutes to stay accountable, motivated and on track. The sure-fire way to stay committed to your goals. Grab your spot on the Online Program below by choosing weekly payments or pay in full. read on to add personal training. 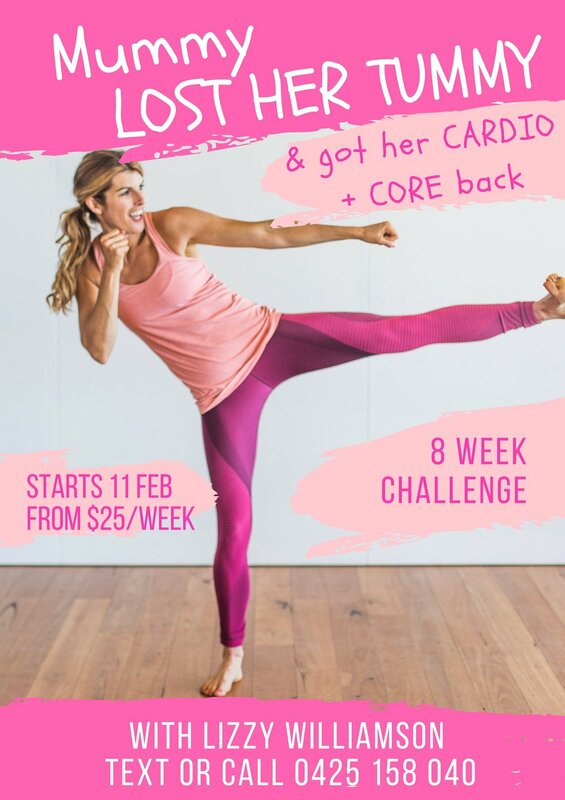 1-on-1 personalised 30-minute cardio and core-blasting personal training sessions with Lizzy - a certified Personal Trainer (over 15 years experience) and Integrative Nutrition Health Coach. Will travel 15 mins from Avalon Beach in Sydney or option to travel to Lizzy. Sessions can also be done virtually via Skype. Prices INCLUDE the $25/week pack above. *Get a friend or group to do this with you and split the total. Eg 2 people for 1 x PT/week = $30 each. Don’t worry if there’s any weeks you can’t do your PT session/s (holidays, sick kids, stuff happens etc) - you can make them up any time throughout the challenge. YOU AND YOUR TUMMY READY? WE Start 11th of February, 2019.